When a friend of mine invited me to spend my Sunday roaming the Ballard Farmers Market, I realized how infrequently I took the time to explore the city I call home. As a student at the University of Washington, it’s easy to stay close to campus – Seattle’s U District is teeming with plenty of restaurants, shops, and recreational activities to keep a student’s weekend busy. Nevertheless, I took my friend up on his offer, hopped on the 44 from U District to Ballard, and spent my Sunday wandering around the Ballard Farmers Market for the first time in the three years I’ve lived in Seattle. Before I dive into all of the fun things to hear, see, and – most importantly – taste, let’s set the scene: The Ballard Farmers Market is a sprawling market featuring some of the best produce from around Washington State. The market stretches on 22nd from Market Street to Ballard Avenue and on Ballard Avenue from 22nd to Vernon Place. Brightly-colored red, yellow, and purple flags stand at the market’s entrances, while vendors, musicians, and the friendliest dogs you have ever pet lie in between. Not to get too off-topic here, but I don’t think that I was emotionally prepared for the number of dogs I would encounter while wandering around the market: big dogs, small dogs, dogs on leashes, dogs in strollers, dogs everywhere! This place is my any dog lover’s dream come true. The market has been open year-round on Sundays from 10:00 am – 3:00 pm since 2000, when it became Seattle’s first year-round neighborhood farmers market. Did I mention that there were dogs? After making as many furry friends as possible, it was time to grab a bite to eat. Surprisingly, the first place I stumbled upon was a familiar one – Nature’s Last Stand of Fall City, WA. One of my favorite spots to visit at the University District Farmers Market on Saturdays, Nature’s Last Stand sells pasture-raised meats, eggs, and specialty sausages. Their spicy Thai sausage is a personal favorite – a delicious, spiced bratwurst that becomes even more delicious when served on a brioche bun and topped with market greens and Sriracha aioli. I would be hard-pressed to find a condiment superior to Sriracha – it simply makes everything better. Standard Bakery was the next pit stop on my Tour de Ballard Farmers Market. While their sign proudly proclaims that their goods are baked with local and sustainable ingredients, it was their selection of bagels, muffins, cookies, and pies that caught the attention of my carb-loving eye. It was a strenuous task to select the tastiest treat from their assortment of pastries, but the Blueberry Ricotta Cornmeal Danish was simply too pretty pass up (until next time, Blueberry Cherry Pocket Pie). Their bakery in Pinehurst boasts an even larger collection of foods, including soups, salads, and sandwiches – I just might have to catch the 41 up to north Seattle and try it out myself. 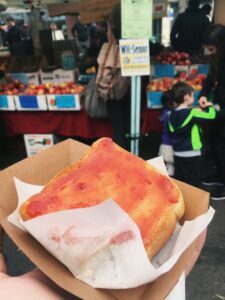 With so many vendors to choose from – hot foods, sweet treats, cider stands, baked goods, cheese dealers, fresh fruits, and more – it was with a heavy heart (and a full stomach) that I left the Ballard Farmers Market without tasting everything. The yummy cuisine, good tunes, and people:dog ratio made for a fun day of wandering aimlessly in a cloud of food aromas and guitar melodies. Thank you for a lovely Sunday, Ballard Farmers Market – I’ll be back next weekend! Edan is the Marketing Intern at Visit Seattle. Born in Wyoming and raised in eastern Washington, he now lives in Seattle’s University District while pursuing a degree in marketing at the University of Washington. He loves Seattle for its delicious food, vibrant culture, and abundance of dogs.